The thing about travel is, we all want our trips to be perfect. But sometimes perfect is beyond our control: rains come, winds howl, sand blows and sifts in through the sides of your tent, piling up like powdered sugar. This, of course, is when things start to get interesting. 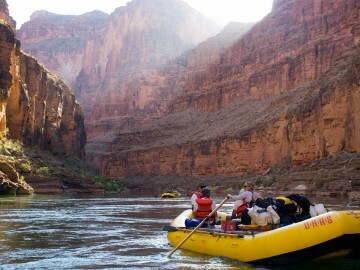 My family and I took an epic Grand Canyon rafting trip a few years back. 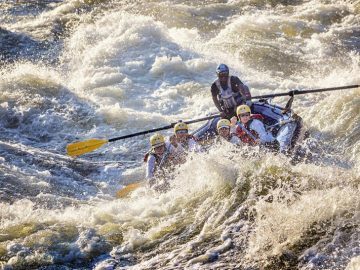 It was grand in every way: 12 days, three generations, six beautiful wooden dories slicing through some of the world’s biggest, gnarliest rapids. But what is it we talk about whenever talk turns to the Grand Canyon? But let me set the scene for you: by week two of this particular trip, our Grand Canyon weather – which had been glorious – turned wacky. “Man, we’re going to get pounded,” our boatman said one afternoon, pushing his oars beneath a purpling sky. He pulled on Gore-Tex for the first time in 10 days. It was August. Monsoon season…This looked serious. A mass of clouds moved in downstream, and although it had been raining steadily, the rain turned, bizarrely, to hail. It grew colder. We joked about the hammering precipitation. “Snowball fight!” someone yelled. Then came the crack of thunder, and there wasn’t much joking. We entered the Muav Gorge section of the canyon, a sinister place to be in a storm. Limestone walls rise nearly 2,500 feet over the river here, and it’s narrow. “There’s no way we’ll be going to Havasu tomorrow,” our guide predicted as we beached the boats. From the small camp where we stood, drenched and shivering, we could see two frappuccino-colored falls rocketing off the rim in front of us. We stared, in awe, as they morphed from picturesque cascades into six, then sixty, then hundreds of mud-spewing pounders thrumming off the canyon rim right above our heads. Across the river? The same drama was unfolding: within 15 minutes the Grand Canyon had turned from a stone cathedral to a violent spectacle. Everywhere was rushing water, rock, and mud spewing down. To our immediate left, a dry creek-bed—where we’d been warned minutes before not to camp—was spewing semi-truck-sized waves of foamy muck. We watched, riveted, while the explosive water moved a massive, Sub-Zero-size boulder toward the river. Each of us was suddenly acutely aware that we were standing at the bottom of the deepest drainage in North America. Erosion, typically more of a concept than a run-for-your-life drama, was happening, real time, all around us. 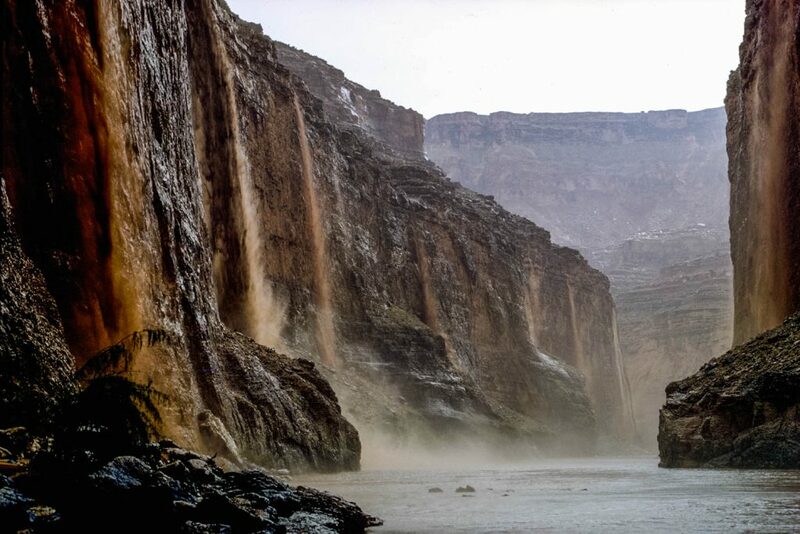 It’s as if the canyon had literally sprung to life—water cascading off the cliffs, beaches breaking up. That’s right, the Grand Canyon wouldn’t even exist if it weren’t for extreme erosion, I finally remembered, agape. “You could be here 50 years and not see this,” our head guide Regan said, eyeing the situation like a hawk. That’s when his wife, Ote, announced army-style that we’d set up camp—right there in the wet sand. And we did. It might not be pleasant, but an abutment protected enough of the beach that we wouldn’t wash away. 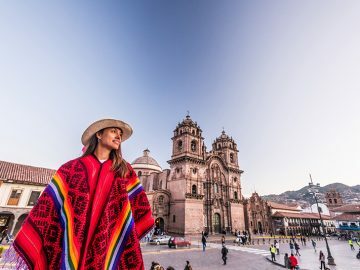 We pitched our tents, pulled on dry clothes, had a soul-warming dinner of chicken tacos and tortilla soup our guides whipped up under a beach-tarp, then crawled into our tents and didn’t sleep very much. By morning though, the waterfalls had utterly vanished, and the sun was shining. 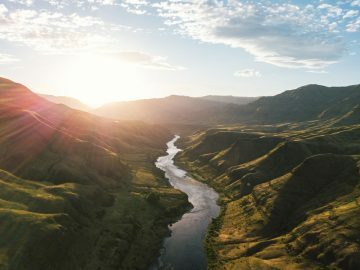 The only sign that anything had happened or been amiss was park service helicopters buzzing the river like angry mosquitoes. Downstream at Havasu, which has a history of flooding, water had swept away rafts, tents and supplies. 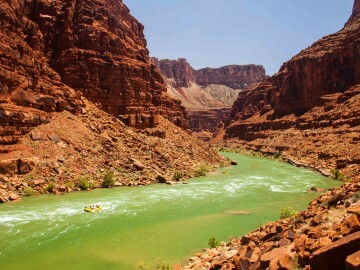 Fifteen rafters were airlifted out of the canyon later that day after spending the night perched on a rock ledge in their bathing suits, just a few miles upstream from where their rafts were last seen before disappearing in a violent flash-flood surge. What Regan and Ote had understood, and less-experienced rafters had not, is that flash floods can endanger people miles from an actual thunderstorm. They also knew Havasu has a history of flooding; in the last 100 years at least 16 major floods have swept through. Nearly all the floods resulting from torrential rains many miles away. I stepped into Ote’s boat, buckled my life-vest, and we all pushed off again. 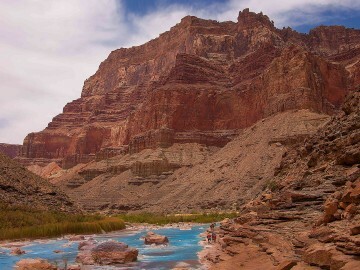 The canyon held the pleasing smell of minerals, dirt, and tamarisk. Ote sent her 11-foot oars planing through the water with smooth, even strokes. As the blades emerged from each stroke, droplets flickered off the ends, flashing in the morning light. Everything looked refreshed and cleansed. 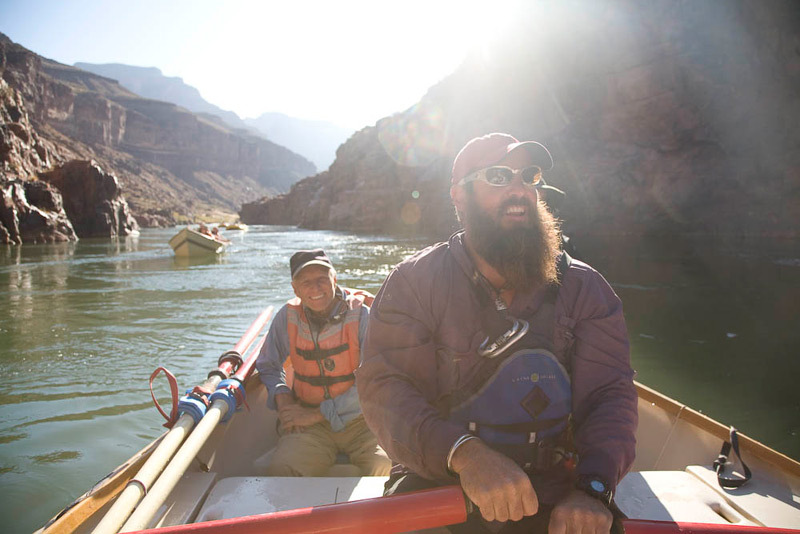 I’d wanted to take an epic trip, to share an ultimate Grand Canyon adventure with my family. I’d wanted my boys to know the enormity of nature, to feel humbled by this place. And somehow? We’d hit the jackpot. “You live your life for these moments,” my husband said, feet up, dragging a hand in the water. No kidding, I thought, in the enormous stillness that filled the canyon. I looked around at the other contented faces of the group and felt that we had all been through something together. Something epic. Then I watched the river carry us away in our flotilla of small boats, thoroughly rinsed, wind-dried, and as alive as we’d ever be.